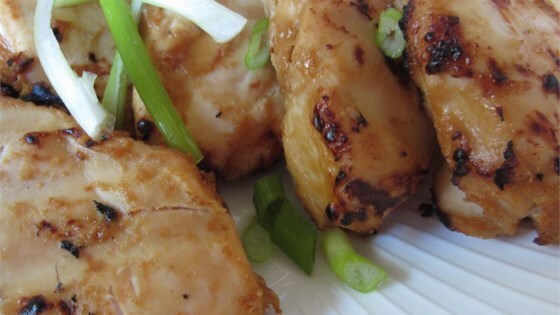 "Great Asian style marinade with a kick. Works well with chicken or beef." In a large bowl, gradually stir hot water into peanut butter. Stir in chili paste, soy sauce, oil, vinegar, garlic, ginger and ground red pepper. Place chicken in marinade, and turn to coat evenly. Cover, and refrigerate overnight, turning occasionally. Preheat an outdoor grill for medium heat, and lightly oil grate. Thread chicken pieces onto skewers. Discard marinade. Grill chicken 8 to 10 minutes per side, or until no longer pink, and juices run clear. This was a big hit! I didn't have ginger so added a little extra garlic and was very tasty. I served it with white rice and carmelized onions. Definitely will make this again! I used Thai style chili sauce and white rice vinegar. I boiled the leftover marinade for 10 minutes and used it as a sauce over top. Delicious! It was really easy to make and boyfriend loved it. I also subsituted seasame oil for vegetable oil for a little more asian flavor. I suggest holding some of the sauce on the side for dipping!